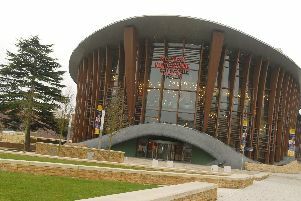 The Illegal Eagles returned to a packed Aylesbury Waterside Theatre for their 20th anniversary tour. It's no surprise that the Illegal Eagles are renowned as the world's number one Eagles tribute band, and the title is well deserved. In reality, they are so much more than a tribute act. They are all exceedingly talented musicians with a wealth of musical experience, faithfully recreating the sound and style of the band's seventies country rock classics. Opening with How Long, the band captured the attention of the Aylesbury crowd right from the get go with their impeccable harmonies and energetic stage presence, and the comedic introductions throughout the night by the band's bassist, Trevor Newnham. Throughout the evening the band members effortlessly switched instruments and delivered endless crowd pleasers, each met with roof raising cheers and applause from the audience. The biggest cheers however were reserved for the ultimate hits, Hotel California and Desperado, and the hauntingly beautiful solos by the "master of all trades", Garreth Hicklin. The audience thoroughly enjoyed the evening, dancing and singing throughout the show, and rightly so. If you closed your eyes, you'd think these really were the Eagles. As far as tributes go, they don't get any better than the Illegal Eagles.